Well over a decade after the release of the first edition of Betrayal at House on the Hill, the new Betrayal Legacy is aiming for a release later this year. At its core, the new game uses the same rules and formula that made the original game so fun. But imagine if every session you played had real consequences, and an ongoing story flowed from one game night to the next, completely shaped and customized by the decisions, victories, losses, and betrayals that came before. The most intriguing aspect of Betrayal Legacy is its treatment of time, particularly the dynamics of family heritage, and the changing nature of horror across decades and centuries. In a story spanning hundreds of years, it’s the enigmatic house up on the hill that is the true main character. Players watch it as it twists and reforms across the generations, terrifying and killing its visitors with new horrors fit to that era’s greatest fears. Each player takes on the role of a family and its many descendants, and plays members of that same family as they return time and again to the same site that so haunted their ancestors; something (it would be a spoiler to know what) keeps dragging them back. Sometimes your playable character carries over from one session to the next; the irascible teenager in the early 1900s is the world-weary old man in a subsequent session. At other times, you might play your prior avatar’s descendant. Either way, you create and name your hero, but he or she is always a member of the same family, and a predisposition to traits like physical might, speed, or sanity carry over. “There are five different minis that you get in the game,” Daviau says. “There’s an adult male, adult female, younger male, younger female, and then a child. Instead of that being the same character every time, at the beginning of the game, you pick one of the figures, and put your family’s colored base on it.” People weave together their own family story, and can even choose to role-play traits that carry over from one generation to the next. As the game begins, the first task that gets the ball rolling isn’t especially honorable. “It’s a homestead somewhere in the New World,” Daviau says. “We never give it a particular place, but I live in New England, so in my mind it’s always very close to where I live. You’re at a house because the family that lived there died. You are there to look through their stuff and see if you can find something valuable. Each of you pretends that you’re there to honor the dead, but you’re not fooling anyone. The families aren’t noble, or driven by some higher nature. They’re fairly petty.” As they plunder the house, the players find treasures left behind by the previous inhabitants. You name those items, put a sticker crest on them, and claim them for your family. If the item shows up decades later in a different session, it’s an heirloom, and it’s more powerful when wielded by a member of your clan. No matter how your horror novel plays out, after the final chapter concludes, Betrayal Legacy will remain playable. “After you’ve done 14 chapters, you have an infinitely replayable game that’s fully customized,” Daviau says. “You will have only seen about a third of the haunts that are in the game. You can keep playing it.” That’s a trait that isn’t shared across all legacy games, and boosts what is already likely to be an engaging game to go back onto the table with frequency. 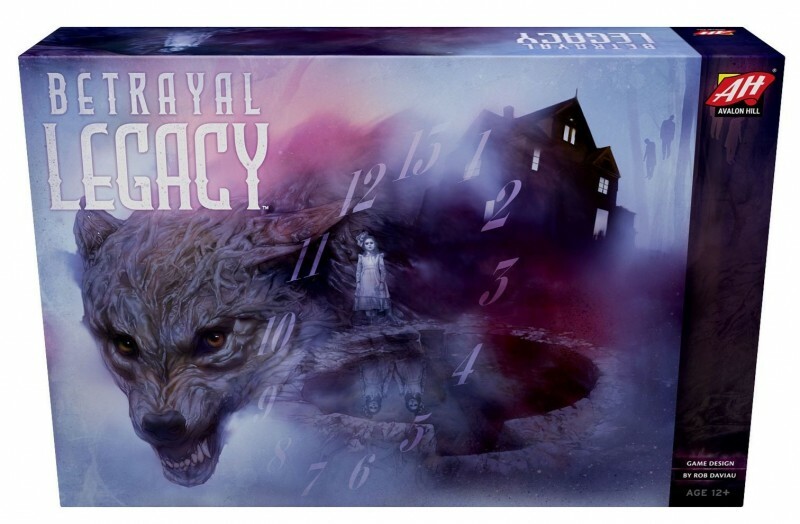 Our first look today at the final box art for Betrayal Legacy hints at the tone that Daviau’s team is shooting for. “We definitely went PG-13, and not PG,” Daviau says. “The original game has a certain tongue-in-cheek quality, and plays on a lot of monster movies from the ‘50s. Some of those are kind of serious, and some of them are more like a ‘I was a teenage werewolf’ sort of feel. People weren’t quite as tongue-in-cheek about their horror in 1740. ‘No, there are monsters that live in the woods, and I’m terrified.’ So, we tried to make Betrayal Legacy a little more serious. There are still a lot of winks and jokes, but the cover immediately sets the tone.” While Betrayal Legacy doesn’t go for gore, the cards and narration have an unsettling quality that maintains its roots in horror. In conversing with Daviau, it’s clear that Betrayal Legacy is a passion project. Not only was he involved in the original game’s inception, but it’s also a personal favorite for him. “I have worked on dozens of games, and probably brought to market over 80 in a 20-year career, and Betrayal at House on the Hill is the only game that I have worked on that I regularly want to play after it’s published,” Daviau says. Betrayal Legacy has a high bar to cross when aiming for that same kind of longevity – players can make up their own minds if it succeeds in just a few months. 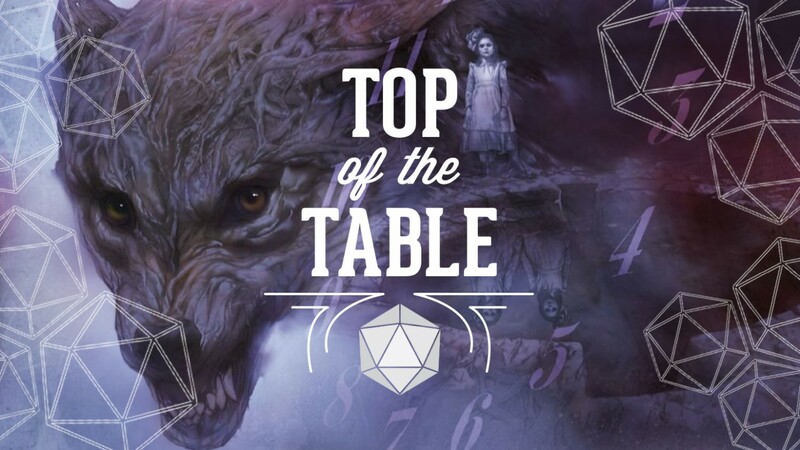 As you wait for a chance to confront the dangers of the haunted house, you might want to peruse our backlog of Top of Table articles, including some great similarly themed horror games that are appropriate for Halloween, and our list of the Top Tabletop Games of 2017 (which included Daviau’s Pandemic Legacy: Season 2). As always, if you’re looking for a personalized board game recommendation for your friends or family, drop me a line via email or Twitter, and I’ll do my best to provide some suggestions.